Bunny, what a wonderful little scene you created with this stamp. Love the colors so bright and cheerful. Sentiment is perfect!! So glad you had time to join us for the House Mouse and Friends Monday Challenge with another card. I am really becoming a fan of your beautiful work. I love how you embossed the sun rays behind your adorable image! Perfect match up! Thanks for sharing your talent at Penny's Paper Crafty Challenge! Thank you for playing with us at House Mouse and Friends Monday Challenge. Goodluck and hope we see you again. Super cute beach card! Very fun! Thanks for sharing with us at Word Art Wednesday this week!! 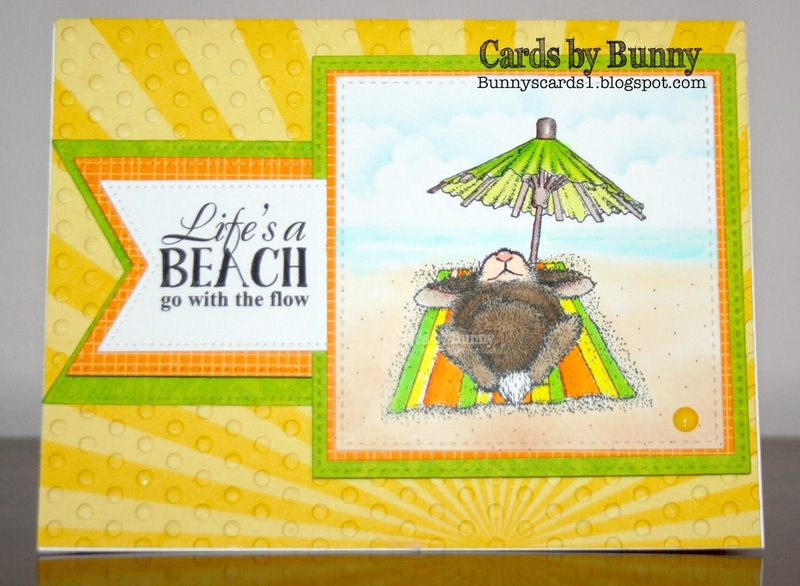 Hi Bunny how cute is this adorable summertime scene, super fun Hopper image love it. So sweet! Thank you for playing along at Penny's Challenges this week. I am so in love with this card, CAS and bright and bold...wonderful creation! Thanks so much for sharing with us at House Mouse and Friends Monday Challenge. Gorgeous card! The image is adorable and I love the embossed sunburst. Beautiful card! Thank you for joining us here at Word Art Wednesday. We hope you will link more projects with us soon. Leaving you with the inspiration of the scripture in II Thessalonians 3:3 (KJV) " But the Lord is faithful, who shall stablish you, and keep you from evil." God bless! Thank you soo much for taking part in our "anything goes with optional for the girls / Mother's Day” challenge over at Creatalicious & good luck in the draw.